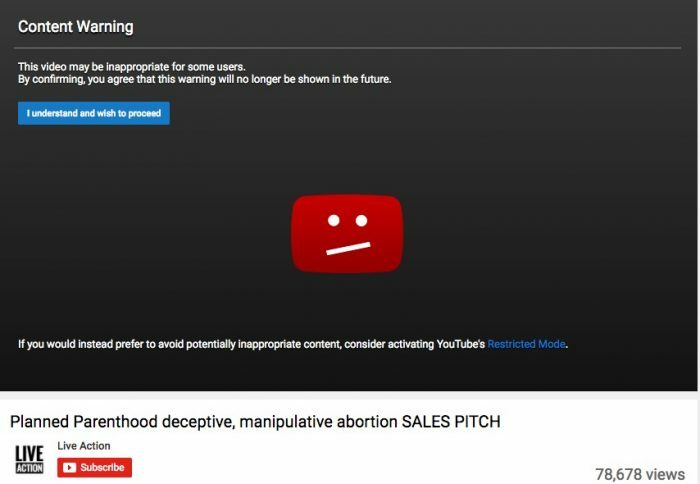 It’s no secret that the mainstream media leans pro-abortion, actively covering up for Planned Parenthood and the abortion industry. They parrot the industry’s neatly packaged scripts for their “news” stories, and, much of the time, simply ignore (or bury) any news that would make the industry look bad. 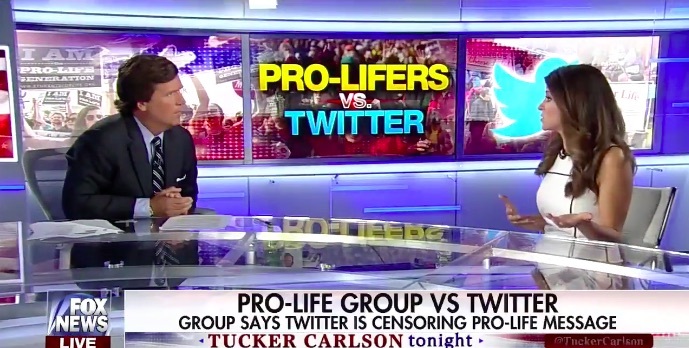 The only way that pro-life outlets can counter the continued onslaught of pro-Planned Parenthood, pro-Roe v. Wade messaging is to take the truth directly to the taxpayers of the nation through social media. These taxpayers deserve to know that their hard-earned dollars are funding an abortion chain that does more abortions than breast exams and commits over 300,000 abortions annually. 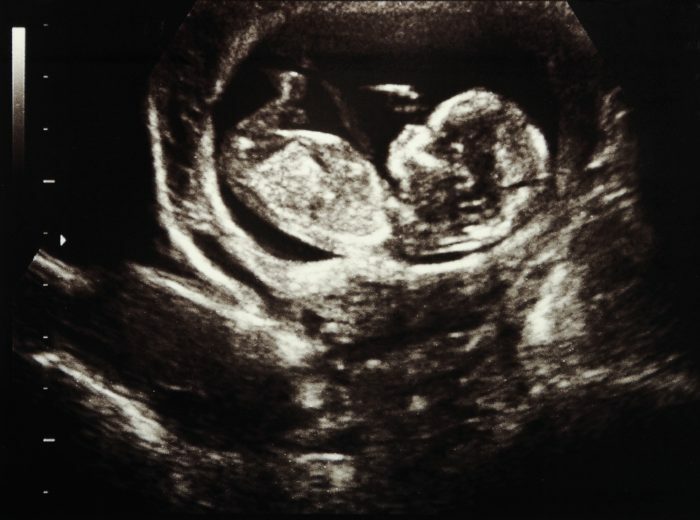 But for a number of years, the pro-Planned Parenthood, pro-abortion bias has been creeping into social media platforms as well, with those in charge of the websites actively suppressing and censoring the pro-life message. This robs millions of people of the opportunity to hear the pro-life viewpoint. But when this happens to pro-life groups — and it does, regularly — calls to end the bias fall on deaf ears. Is this controversial and inflammatory? Twitter has effectively limited speech on the side of the issue it apparently rejects. This is disturbing behavior for a social media platform with over 300 million active monthly users which presents itself as a forum for people to voice a variety of opinions. Twitter’s mysterious “policy committee” determines what content is offensive according to rules and standards it alone defines, with little explanation and no process for appeal. Live Action was told a year ago that a meeting with this team would not be possible. Twitter has the right to determine its own standards, but its actions are clearly biased against one side of this issue, on which Americans are as divided as ever. 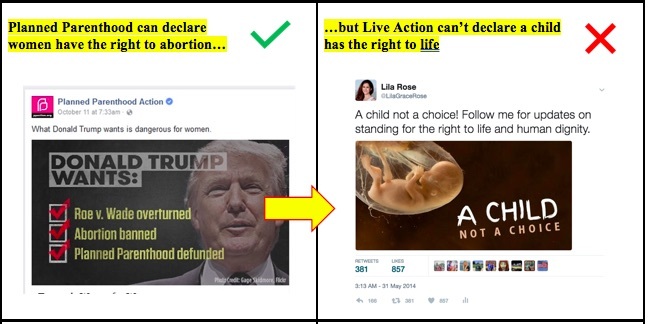 Twitter is suppressing pro-life messages — even simple, basic facts about human development — facts deemed irrelevant by the “pro-choice” side. 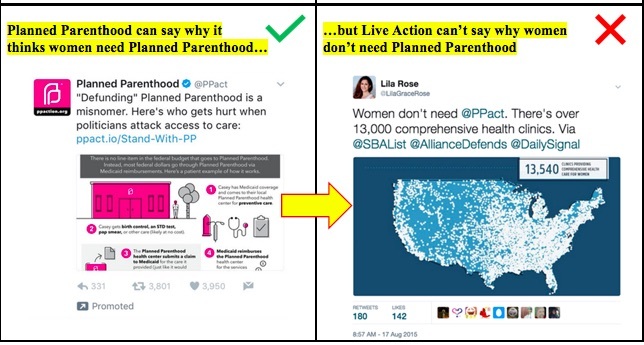 Live Action’s pro-life messages in the photos above contrasted with Planned Parenthood tweets are from its regular Twitter feed and can still be found there. 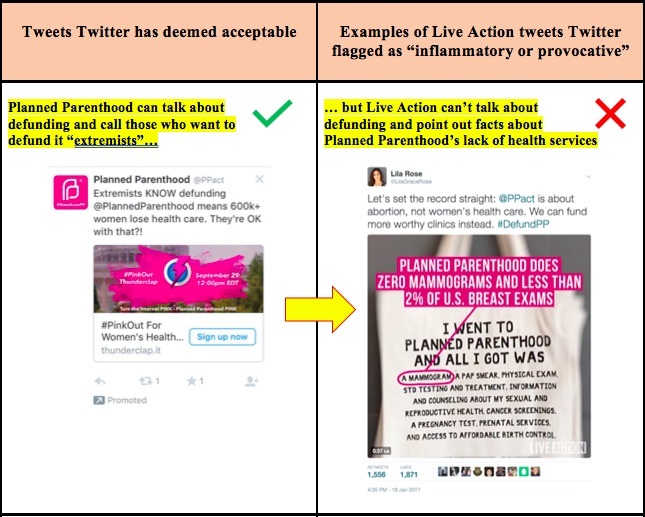 In order for Twitter’s advertising ban to be lifted, we have been told we must delete these tweets and others like them from our feed, because they are considered “inflammatory.” Planned Parenthood’s tweets, however, are not considered “inflammatory,” and its ad account is in good standing. Editor’s Note: This article has been revised from its original publication on June 27, 2015. Read the original here.